If there’s anything that compounds the magical allure of a trail in winter, it’s a frozen waterfall at its terminus. Frosted trees, sparkling rivers, and invariably fewer people converge to paint an entirely new picture of a trail—even for those who might frequent it often during the warmer months. Plus, bird migrations, hibernations, and shorter days invite an entirely different animal population in the surrounding woods. This January marks the first of our 12 Months of Adventure, and we're looking for true winter magic. Such is true for a stunner like Tamanawas Falls on Mount Hood’s shoulders in Oregon and a roadside favorite like Kaaterskill Falls in New York. Many are familiar with the thundering cascades in the summertime, but far fewer have made the effort to get a glimpse once winter makes its mark. Below we’ve highlighted our favorites from the west, mid-west, and east—but scroll a bit further down to see the complete list. Happy wandering! Donut Falls. Photo by Kyle Jenkins. A classic Gorge waterfall gets a gorgeous refresh when the winter snows fall. It isn't an annual guarantee, so be forewarned before you make a foray to Panther Creek, but when it's white, you will be rewarded mightily with one of the Pacific Northwest's most stunning waterfalls. Large aspen and pine trees line the creek that hugs the trail up to the falls—one of Salt Lake’s favorite. Because it is so popular, the snow will most likely be packed down regardless how soon your arrive after snowfall. Keep an eye out for moose, deer or porcupine, which are all common in the winter months. The iconic Stewart Falls hike in the city of Sundance is especially stunning when blanketed in snow, but getting there safely takes a little planning. You get fantastic views along the way, and you end up in front of Stewart Falls for the ultimate snow hike reward. Snowshoeing into Donut Falls is a really fun, easy, and relatively safe way to enjoy the Wasatch mountains in winter. This is a really popular trail in the summer, and although there are less people in the cold, you will still see plenty of hikers. The trail starts off climbing a bit with a few switchbacks, and it gains the majority of its elevation in the first half of the hike. Enjoy the views up Fish Creek Canyon and look for ice climbers on Fish Creek Falls across the valley. This well-marked loop includes views of Salt Creek Canyon and Diamond Creek Falls. Traversing woods, gingerly navigating footbridges, and gawking at the stellar views from two viewing platforms along the way converge to make this one of the best in the west. Though the trails are not maintained for winter travel, icy slopes abound, and there might not be many clues for navigating the steep cliffs along the McKenzie River, those that are up for the challenge will experience the power and magnificence of these waterfalls in winter. See the wintry side of this magnificent waterfall on Mount Hood's eastern side with a relatively easy snowshoe hike through old-growth forests. While popular and oftentimes crowded during the summer, this falls sees only moderate activity during the middle of winter, which only adds to its grandeur. Due to the historic floods in 2006, the road to the Ipsut Creek Campground is permanently closed. This provides a beautiful snowshoeing trek along the old service road, through old-growth forests, and along the incredible Carbon River until you reach Ipsut Falls. If you fancy checking out the popular Alpental backcountry near Snoqualmie Pass and chairlifts and downhill runs aren't quite your thing, the snowshoe and cross-country ski route to Source Lake presents an excellent alternative. Downstream of Source Lake you will run into a smaller waterfall that makes for a great snack stop. Skirting outside the northern border of the Alpine Lakes Wilderness, the Elizabeth Lake snowshoe and ski route winds up a mining road through a chattering creek valley, ending near a charming little 7-acre lake. Two unnamed waterfalls flow into Money Creek and offer a great spot for photos before finishing this there-and-back hike. Though most opt to see the falls from the upper viewing platform, there's also a well-marked snowshoe trail that takes you to the base of the falls, and allows an entirely different perspective—one that does justice by this 141-foot stunner. Conditions often vary, but visit January through March and your chances of seeing ice crystals galore is high. Kaaterskill Falls. Photo by Nick Catania. The polar vortex is back after slumbering for a few years, and with the deep winter temperatures you may be able to catch a winter spectacle of exceedingly rare proportions: If the temperatures drop low enough, witness this 65-foot stunner fully frozen over. That's enough to get anyone out of their bed. Bundle up. A popular and beautiful all-season hike near Virginia Tech, find it at its most beautiful when coated with a blanket of winter snow. Once the leaves fall, the vantage of the 70-foot cascade opens up for even better views, too. Given its popularity, you might find that the cooler temps drive away crowds, which means more of that gorgeous cascade for yourself (and easier parking, too). 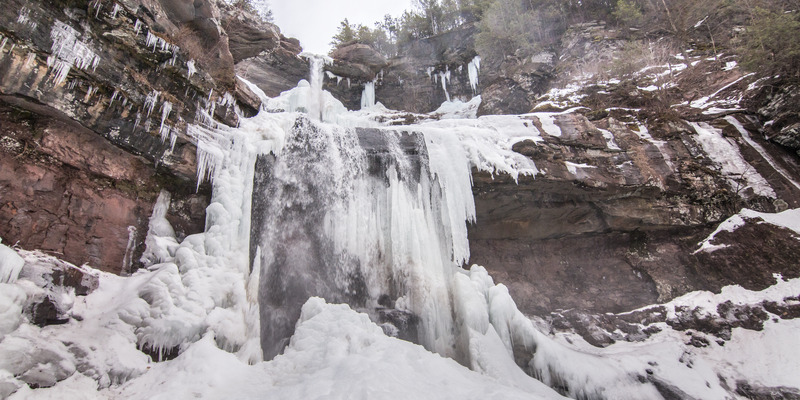 Arethusa Falls is a popular hike in the White Mountains, and come winter it is a popular spot for ice climbing. The falls are located in Crawford Notch State Park and are the tallest waterfalls in New Hampshire. Following the Bemis Brook Trail to Arethusa Falls will add a few other frozen falls to your hike before ultimately reaching Arethusa Falls. A stunning, frozen Rainbow Falls is merely one of the prizes for your effort on Sawteeth Mountain. Summiting New York’s 35th highest peak also rewards adventurers with views of Austable Lake, quiet woods, and exciting, steep exposure. Note that the first three miles of trail are on a closed road. As New York’s tallest two-stage waterfall and one of America’s oldest tourist attractions, Kaaterskill Falls by no means serves up any solitude. Nevertheless, the minimal effort required to reach this stunner puts it at the top of our list. Though the path is manicured, it’s not always shoveled, so bring your snowshoes along even if you’re joined by many others in the parking lot. The Kadunce River is located just north and east of Grand Marais on Highway 61, and it provides summer visitors with several waterfalls and rapids. When the river freezes over in the winter, snowshoeing up the canyon becomes a possibility. Just a half mile in, you'll reach the waterfall—where you may even be able to watch some ice climbing. This is just a small selection. Scroll through the featured adventures below for more winter waterfalls. While many of the adventures on this list (including the two above) are leisurely strolls or roadside stunners requiring little to no technical experience, there are several for which a knowledge of basic snow science is recommended. Here’s your cue to look into Avalanche 1 and WFR course options near you! 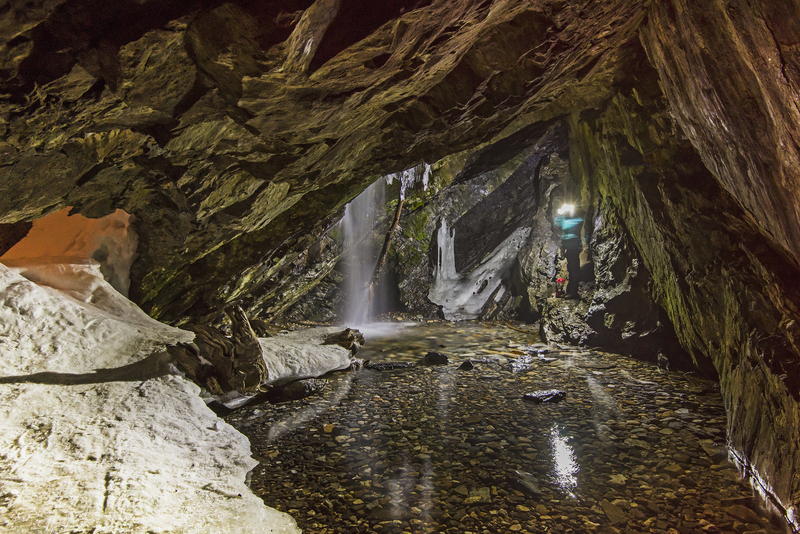 Have a favorite snowshoe-to-waterfall adventure that you don't see on the list? Comment below!